GLAD congratulates Connecticut for closing the Connecticut Training School, the last large youth prison in the state. This is an exciting and promising moment for Connecticut, particularly for the youth and advocates, including the Connecticut Juvenile Justice Alliance, who worked so hard for the facility’s closure. We know that youth prisons do not work. 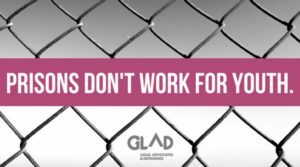 They particularly do not work for LGBTQ youth and for youth of color, who continue to be disproportionately represented in the juvenile justice system, and who suffer from high levels of harassment and abuse when incarcerated. The decision to close this facility reflects evidence and understanding that we can meet youth needs for growth and development, and address public safety needs, with quality community-based programs and a focus on treatment and skill-building rather than incarceration. Resources must be focused on diverting youth from entering the juvenile justice system, and providing care and services for youth in their communities. Closing the Training School is a momentous positive step, and we hope and expect the state will invest substantial resources in local communities to address the needs of youth, and to support youth and communities with a robust continuum of care. Connecticut has shown strong leadership in closing its last youth prison, and has an opportunity to be a model for the region and the nation. We hope other states, including Maine where GLAD and other youth advocates are actively engaged in addressing serious issues at Long Creek Youth Development Center, will follow the example Connecticut has set.